1. Cut slices of Swiss cheese to fit the crackers. 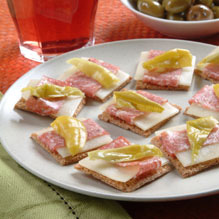 Top each cracker with a slice of cheese and salami. Top with a small strip of peperoncini.